Ever since reading Richard Harland’s YA steampunk novel, Worldshaker, in 2009, I have been eagerly awaiting the sequel. I am very pleased to say that it has lived up to all my expectation. It’s an exciting, imaginative and engaging read. Set in a world where Imperialist societies exist on massive mobile juggernauts, powered by an oppressed sub-class known as the Filthies, Worldshaker and Liberator are terrific example of the steampunk genre. Steam-driven machinery, Victorian elegance and exciting adventure combine to make these books difficult to put down. In the first book we met Colbert Porpentine, grandson of Worldshaker’s supreme commander, and Riff, one of the Filthies. Together, they brought about a revolution in which the Filthies overthrew the ruling class and took over the juggernaut. In book two, the juggernaut has been renamed Liberator, but despite the high ideals of the revolution, things are going wrong. There is a saboteur on board the juggernaut, a murder has been committed, radical elements are gaining power and distrust is rife. The Filthies want to take their revolution out to the other juggernauts, but the Imperialist forces are determined to stop them. Col and Riff’s relationship is put to the test, as loyalties are called into question. Exciting stuff! 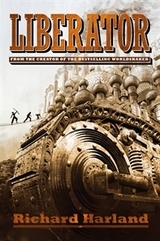 The story of Liberator is every bit as enthralling at that of its predecessor. Twists and turns abound, as do marvellous machines and bizarre characters. One of Harland’s strengths as a writer is his characterisation. He creates such unusual and fascinating characters — from the important leads, through to minor players. In Liberator he has taken the characters he introduced in Worldshaker and developed them further. The two main characters, Col and Riff, are given new challenges that test their abilities and allow them to grow as human beings — also allowing their relationship to develop further. They are easy to like, sympathise with and cheer for. It is also great to see Harland develop other characters from the first novel. The schoolteacher Mr Gibber, who played a relatively minor role in the first book, is back and he’s more important this time around — his foibles and strengths have a great impact on events. Sephaltina Turbot is also back, and we get to see a new, less-refined aspect to her character. And it was a joy to read about Victoria and Albert, the former figureheads of the Worldshaker juggernaut. Their unwavering support of the revolution and genuine love for each other makes them extremely likeable characters. There are, of course, a host of new characters joining the returning one. Chief among them is the extreme revolutionary Filthy, Lye. While her manipulative ways make her thoroughly unlikeable, her background and the difficulties she has faced make her very compelling. This book is definitely on my highly recommended list!